When to Run the Rollover Process ? Please don’t wait till last minute if you want to make Pay-in instructions on T+2 or if you are an active institutional broker. Please do the rollover process the previous day. Enter any new client accounts required to be opened in the previous year because after rollover new clients will be allowed only in 2017-2018. Ensure all trade processing activities are complete on 31st March including Commodities – Import of Trades, Closing Rates, etc..
All the Settlement related Accounting journals for 2016-2017 should be completed in spite of the fact that the settlements traded on 30th and 31st in Equities will be accounted for in the next financial year (You will notice the usual accounting entries are not displayed, but thats Ok). Remember this is important as the Obligation figures of these settlements need to be reflected in the Exposure Uploads and Risk Analysis for the 3rd April Trading Session and other interim requirements. Complete all Demat Delivery entries/transfers including any Margin Hold and Release. Keep the Slip date and the Execution dates the same. SharePro will not allow you to set the execution date after the 31st as it creates a mismatch in the DP and BO holdings. Auction process for all settlements having shortages with payout date on 30th e.g. (1617247W, 1617247Z, 2017059N & 2017059W)to be carried forward to Current Year Auction Settlements. Auction process for settlements having shortages with payout date on 31st e.g. (1617248W, 1617248Z, 2017060N & 2017060W) must be carried forward after the rollover to a Next Year Auction Settlement but this can be run only after the rollover. Important: Ensure you have downloaded the latest Admin and Client EXE from our website and update the 1617 database by running SHADMIN. 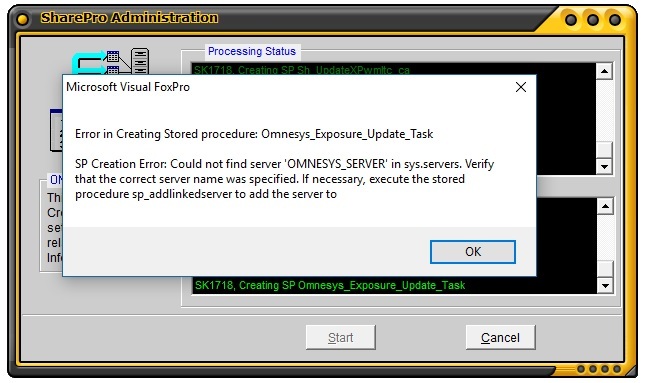 If you get the error message like the one below related to Omnesys during the Admin upgrade simply click OK and continue. But if you get any other messages repeat the Admin upgrade it should not appear again on the 2nd attempt. If a different error appears and persists let us know.